Patricia McCarney, Sustainable Urbanism New Directions Workshop, Qatar University, 21 March 2016, © Qatar University. Sustainable city building must be supported by interdisciplinary research informed by high-calibre city data, maintains Dr. Patricia McCarney, President and CEO of the World Council on City Data (WCCD). Working within the social sciences, she and her colleagues have come to recognize that the key challenge facing urban research that can inform sustainable urbanism is the lack of high-quality, comparable data on city sustainability performance, operational planning, design and management, and quality of life. From Patricia McCarney’s presentation to Sustainable Urbanism: New Directions Workshop, 21 March 2016, Qatar University. Image courtesy of the Global Cities Institute, University of Toronto. This paucity of truly comparable data is a major deficiency for many key strands of research, and ultimately reduces the quality and applicability of the findings, particularly for supporting city governments around the world in dealing with the complex, interconnected challenges of rapid urbanization. In recognition of the inter-disciplinary nature of research required to confront the complexity of sustainable city building, the Global Cities Institute (GCI) has been created at the University of Toronto in the Daniels Faculty of Architecture, Landscape and Design. The GCI builds on the strengths of a rapidly expanding global network of scholars across the disciplines, working with city leaders, design and planning professionals, key international organizations, foundations and industry innovators dedicated to securing a more sustainable future for cities. Patricia McCarney speaking at the Sustainable Urbanism New Directions Workshop, Qatar University, 21 March 2016, © Qatar University. The CGI has led the development of the first ISO Standard for sustainable cities, through an eight-year applied research program working with a network of 250 cities across 80 countries. 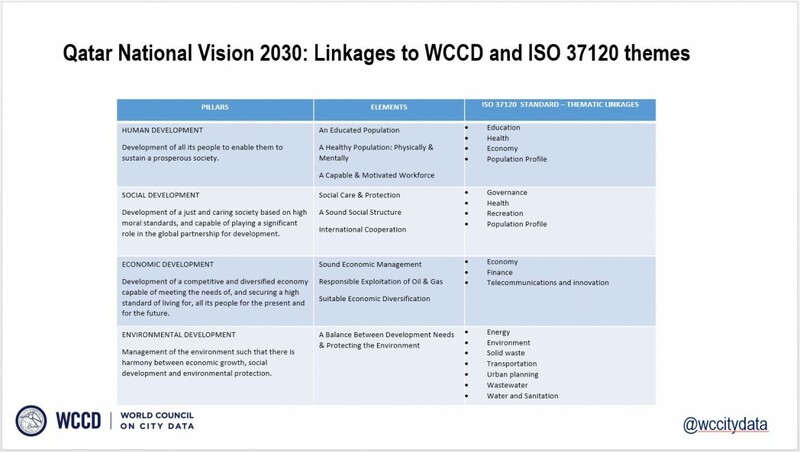 ISO 37120 Sustainable Development of Communities: Indicators for City Services and Quality of Life, enables cities to build a culture of data and innovation to set goals and to measure progress on their city’s sustainability. From Patricia McCarney’s presentation at Sustainable Urbanism: New Directions, 21 March 2016, Qatar University. Image courtesy of the Global Cities Institute, University of Toronto. 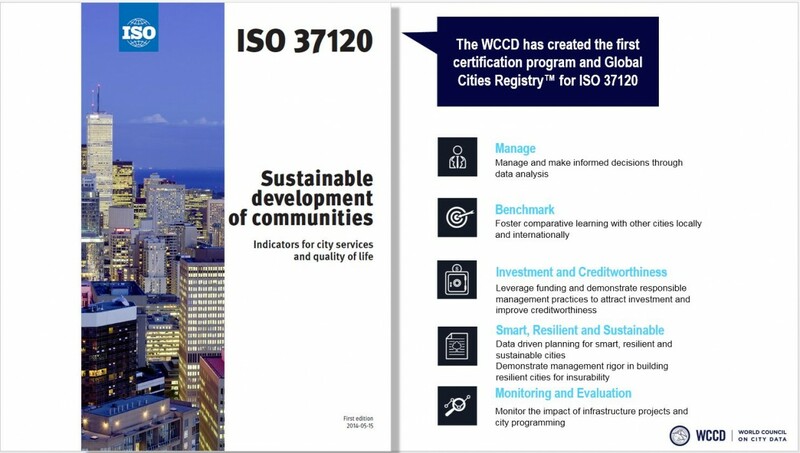 The World Council on City Data (WCCD) has been established to promote global implementation of ISO 37120, and an initial group of 20 WCCD Foundation Cities have already implemented the standard; another 100 cities will be WCCD ISO 37120 certified by the end of 2016. 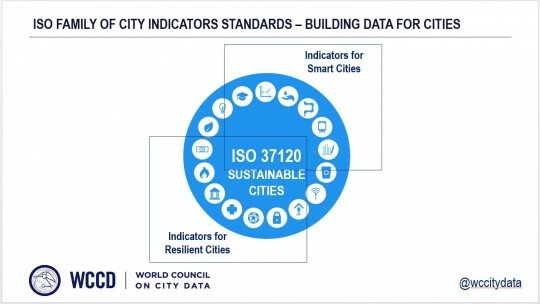 WCCD-verified data is made available through the WCCD Open City Data Portal, the world’s first open, online platform for globally standardized and comparable city data (www.dataforcities.org). The WCCD is positioned as a global catalyst for high-quality urban research and innovation that supports more sustainable and prosperous cities. In this context, the GCI-WCCD see that Qatar has a very exciting opportunity to become a showcase for sustainable, data-driven cities through the comparative power of standardized city data. According to the consultancy Deloitte, Qatar will be investing around US$200 billion in infrastructure in advance of the 2022 FIFA World Cup, including US$140 billion in transportation infrastructure and multi-billion-dollar, city-scale real estate developments. Qatar has set the goal of designing and implementing these projects to promote sustainable urban development, while also contributing to the long-term Qatar National Vision 2030 goal of transforming the country into a modern knowledge-based economy. From Patricia McCarney’s presentation at Sustainable Urbanism: New Directions, 21 March 2016, Qatar University, © Patricia McCarney. 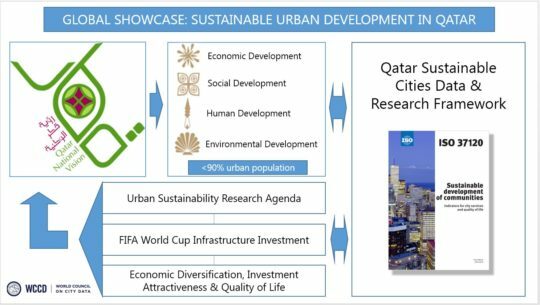 This urban investment program is an ideal opportunity to leverage inter-disciplinary research informed by the power of standardized city indicators to assist smart investment decision-making; to demonstrate positive environmental, social and economic impact for Qatari citizens; to highlight the investment attractiveness of Qatar as a knowledge-based economy delivering high-value research and innovation; and to become a data-driven showcase for sustainable urban development for the Middle East and globally. Prof. Dr. Patricia McCarney is President and CEO of the World Council on City Data (WCCD) and is a Professor of Political Science and the Director of the Global Cities Institute at the University of Toronto, Canada. She received her PhD from MIT in 1987. She has served as Associate Vice President, International Research and Development at the University of Toronto. Before joining the University of Toronto, between 1983 and 1994, Patricia McCarney worked as a professional staff member in a number of international agencies, including the World Bank in Washington, D.C., and the United Nations – HABITAT in Nairobi. She is currently a member of the ISO Technical Committee 268, Sustainable Development in Communities, where she is Chair of the Working Group on City Indicators. She was integral to the development of the newly published ISO 37120, the first International Standard for Cities. This ISO Working Group under her leadership is now building a family of three international standards on global city indicators for sustainable cities, resilient cities and smart cities. Leading the WCCD, Patricia McCarney is building a globally standardized database for cities worldwide, inviting cities around the world to build city data in conformity with ISO 37120. As host of this new knowledge platform, the WCCD is positioned to be the leading global city data base with standardized, verified, comparable and open city data.